Domestic passenger growth in the Indian aviation sector was back to single digit, at 9.1 percent, in January. Despite being the seventh largest, and projected to be the third largest market in the world by 2040, the sector saw a slump after four years of double digit growth. Indian airlines carried 1.25 crore passengers in the month of January, against 1.14 crore passengers in the same month last year. The number was, however, marginally less than 1.26 crore passengers carried in December, 2018. While government’s arm, Directorate General of Civil Aviation (DGCA), reasoned that the slow pace was due to a “lean tourist period”, sector watchers say it is a “self-inflicted” pain for the industry. 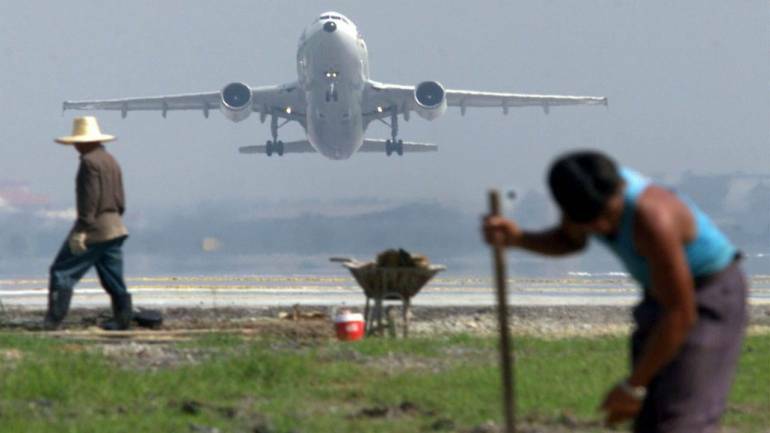 “It (slowdown in the growth) is an issue created, both, by the government and the airlines,” Harsh Vardhan, senior aviation expert told Moneycontrol. He said that the sector was incurring losses due to increased cost which is because of high taxes levied by the government, coupled with “aggressive fleet expansion” by the airlines and “sense of uncertainty”. First two months of 2019 saw numerous flight cancellations due to various reasons including unviable weather condition because of fog and western disturbances. More than 30 flights were cancelled till the second week of February by market leader IndiGo, after which, the cascading effect led to cancellation of 49 flights on February 13. The budget carrier issued a statement that it will continue to curtail 30 flights per day till March 31, 2019, due to weather uncertainty, NOTAMs and unavailability of pilots. “Frequent flight cancellation has dampened the sentiment. People are cautious while booking their flights. Individual carriers have suffered because of that, leading to a cumulative slowdown,” Vardhan explained. Jagannarayan Padmanabhan, Director and Practice lead – Transport and Logistics, CRISIL Infrastructure Advisory told Moneycontrol that the fall in growth could be attributed to multiple factors such as the end of the holiday season, multiple flight cancellations and increased fare. For some time now, Indian airlines have been in the red due to increased cost on the back of high fuel prices. Crude price had firmed up in 2018, touching an all-time high of $86 per barrel. After cooling off a little, it is going north again at $57.55 a barrel following supply cut by Organisation of Petroleum Exporting Countries (OPEC). “Primarily, the government is the main culprit. May be, if the fuel prices were not so high and fares were 20 percent cheaper, the growth would have been similar to past trends and the losses would have been less,” Vardhan said, adding that the government needs to “rationalise” fare structure in India by “rationalising fuel prices”. “Now, with the fuel prices going up, the government has been charging high taxes in India. So, while the international market is a little relaxed, people in India are paying prices higher than what they were paying six years ago at the same oil price levels… For the first time, fuel prices in the world are going down but it is going up for Indians,” he said. According to Centre for Asia Pacific Aviation (CAPA), an autonomous knowledge centre for aviation, Indian carriers are poised to lose a total of $550 million to $700 million during 2019-20, less than an estimated loss of $1.7 billion for 2018-19. CAPA had earlier estimated loss of $1.9 billion for 2018-19 when the crude touched record high price in late 2018. US aircraft manufacturer, Boeing, told Moneycontrol that Indian carriers could become profitable, provided they were ready to “forego growth” by increasing ticket prices. “If they increase the fare by certain amount, based on their own internal calculations, the 12 million people (travelling a month) are not going to disappear completely,” said Dinesh Keskar, senior vice president for sales, Asia-Pacific region, Boeing. “A lot of people are flying on the expenses on their company for business purpose. While, a person may not be completely indifferent towards fare, but a 5 percent hike will not lead him/her to cancel the business trip worth billions of dollars. There are many people today, who are particular that they travel in business class and who are willing to pay the extra amount,” Keskar said. Keskar favoured a cut in growth percentage over mounting losses and said that an airline must at least break-even — a level where cost incurred by a company is equal to the revenue being generated. He explained that customers come back to establishments for the quality of service they receive. With increased prices, an airline may lose out on a family of four, using airways for leisurely purpose, and who prefer to save money. “The point is that, there will certainly be some people of that double digit growth who would say they do not want to travel at increased price and that growth will go down. But even if the growth comes down from 18 percent to 15 percent, (but) with everybody paying their fair share and airlines recovering their costs, then I feel that is a better model than just lower the fare for everyone and keep bleeding,” Keskar added. As pointed out by Vardhan, airlines have been steadily increasing prices in India to test the “acceptability”. It has been reported that air fares are up by almost 15-20 percent over the last couple of months. But, can it be traded for growth? Experts feel, no. “Pricing power is slowly shifting back to the airlines. It will be good for them to wrest this with themselves and not squander it for growth,” Padmanabhan said. Vardhan said that the economic downturn in India does not give power to the airlines to hike fares. “When there is an uncertain situation in the economy; there are layoffs; there are companies closing down; and small or medium enterprises are not doing good, the traffic will go down because 60-70 percent of people are working in this sector… The moment you increase ticket prices to, say Rs 4,000 (for a one way trip), people will switch over to other modes of transport,” he said. The aircraft manufacturer, however, opined differently. It said that Indian airlines were not touching their break-even levels for the fear of losing their market share. The move, Boeing felt, made them incur losses by virtue of providing the “lowest fares in the world”. “Airlines do have scope… Here is the point, if one airline increases the fare but the other player does not, then you have a risk (of losing the share) depending on the demand. You may have to fly with half seats empty… So that is the calculation that airlines need to do, that if you increase your fare and the other player does not, then how much revenue are you ready to forego?” he said. Vardhan, however, said that in a price sensitive industry as aviation, price becomes tad bit “inelastic”. “This industry, basically, is cost driven. We, however, are in a situation where we are encouraging more and more people to take up airlines as a means to travel due to low fares… So, a low fare industry is price sensitive and there is low price elasticity,” he said. The industry veteran further said that there is a “limit up to which the costs can be passed on to consumers”. “The moment your price starts going up, whatever price increases, you bring it in the cost structure,” he said. Explaining the cost decisions of the industry, Vardhan said that an airline usually considers Rs 40,000 a tonne as an acceptable fuel price. Furthermore, the airline operator may be ready to absorb increased cost up to Rs 50,000 a tonne. “The moment fuel is available beyond that, airlines will pass on that cost to customers. Airlines can only pass 60 percent of the increased cost initially. The moment you cross the threshold of Rs 70,000 a tonne, you can pass only 40 percent of the cost. The moment you try to pass on the cost to the customer beyond this, you will lose customers immediately,” he said. While simple price hike may not go down well with the passengers, Keskar said that curtailing supply could be one option that the airlines might want to explore. He said that by managing aircraft addition, airlines might be able to command price like western airlines. “The reason why profitability is so high in the US is that they have consistently maintained the capacity, that is, the supply is always lower than the demand. So now, if the supply is less you can always command over the price,” he said. “Commitment of (aircraft) deliveries is already there… The aircrafts that are coming today were ordered five years ago, so you cannot stop them without paying heavy penalty… What can be done is that airlines need to have balance between proportionate increase in natural passenger traffic and proportionate increase in aircraft fleet,” Vardhan said. He said that an aggressive but mismatched fleet expansion is the reason why airlines are bleeding continuously. “When there is a constant inflow (of aircrafts) coupled with a price war, the losses will continue to mount irrespective of the number at which the industry is growing… Consider, there is a 10 percent rate of natural traffic annually. If the airline is adding capacity at 16 percent, it will obviously lead to losses, which needs to stop,” the veteran said. Keskar said that India should focus not on only capacity addition but managing it well. A total of 131 aircrafts were added by the Indian airlines during 2018, with IndiGo alone taking deliveries of 60 aircrafts. Apart from excessive capacity and over-supply of airlines, a “flawed business model” too led to airlines being in red. According to Keskar, Indian airlines were following a flawed business model which resulted in duplication of passengers. With greater passenger expectation, the airlines are adding more aircrafts, something that needs to be corrected. “In India, there is one passenger who will fly from place A to B, but all the airlines will claim (rather assume) the person to be its client. This leads to duplication of demand, leading to flawed business calculation. Airlines need to correct for it,” he said. According to Padmanabhan, it is better to have “profitable airlines with healthy growth rates” to have “good health” of the industry. India needs to immediately correct the mismatch between demand and supply to have a healthy growth, feel experts. “In India, we are more focused on adding planes and adding capacity but if that balance (between demand and supply) gets upset and you cannot fill the capacity you have inducted, then you have to sell cheap. And if you sell cheap, you lose money,” Keskar said. At this point, according to Vardhan, only two things could happen, “either the demand increased or one of the operators collapsed”. “It’s an economic cycle. In any industry, the moment supply surpasses the demand, there are losses and the industry collapses… There has to be an industry correction to correct the situation,” Vardhan said. Two of the big aviation players, Air India and Jet Airways, have been under severe debt burden which even casted clouds of winding up. The promoters and the government for former, and Naresh Goyal for latter, have tried to keep the companies afloat due to many reasons including avoiding joblessness. “The resulting unemployment cannot be a reason to continue incurring losses. It is about survival of the fittest. You cannot have it both ways… The economy did not ask you to keep adding aircrafts to your fleet…,” Vardhan said. According to Boeing, India will be the fastest growing aviation market in the Asia pacific region over the next two decades and would be worth $320 billion between 2018 and 2037. The sector will lead the airplane market with 2,300 airplanes, from a total of 16,930 planes for Asia Pacific region. The market will, however, need a steep correction before it achieves the surmountable feat.